While my previous gripe with this show purely centred on the Professor's selfishness and childishness regarding her creation, I've found that I really enjoyed this show once I overlooked that aspect. I'm not really a cat-girl person (I think), but I genuinely adored the cuteness of the Professor after her opening scene in ep05. In fact, Nano's smiles and methods of handling the Professor really made me like her, too; if she's not angry with the Professor for building her in such ways, then I'm not really, either. A big portion of this episode was dedicated to Yukko and her various games during class time. 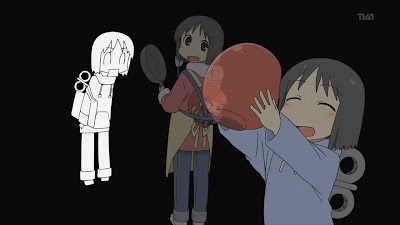 I thought her scene with Mai, playing rock-paper-scissors, was the strongest; after that was her scene with Mio while comparing drawing skills (in fact, Mio's mental breakdown at the shifting paradigm of "cool boy" was pretty delicious to watch); and lastly was her scene with Mio in explaining Kokkuri-san. I actually genuinely loved that first scene; it's becoming addictive to watch Mai due to her sheer unpredictability. Will it grow with time? 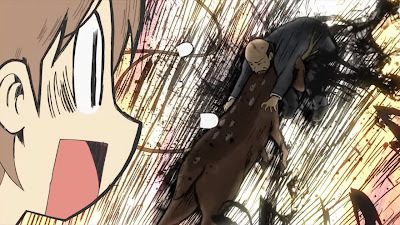 There was only one real scene with the Professor and Nano (well, and then the opener), and it was so-so. The Professor's childish attempt to explain the daruma hidden in her lab coat as a baby brother for Nano was funny and endearing; this episode really made me feel the Professor's age, despite her intelligence. A savant, I suppose. The other scene was regarding Nakanojo (the boy who has a mohawk because hair won't grow anywhere else) and his 8-hour trip to see a fake spiritualist. I'm really liking his character; there's just something about his personality in the face of adversity (in the form of his strange male pattern baldness) that pulls me in. 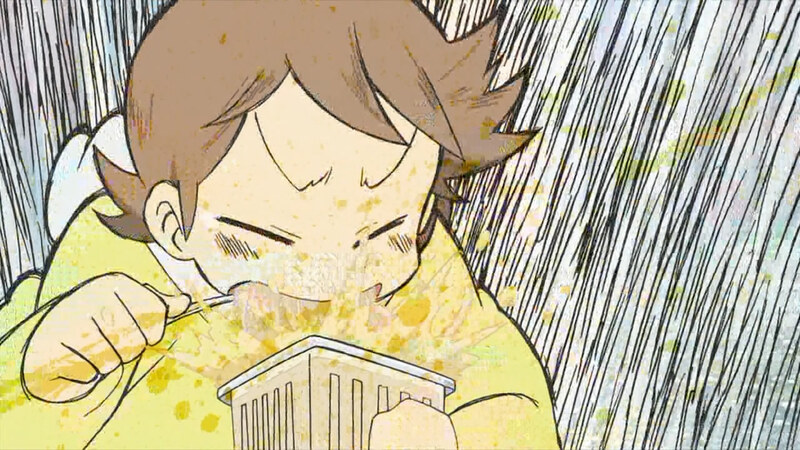 Reminds me of the time I coughed all over my pasta and Pearz couldn't eat it. 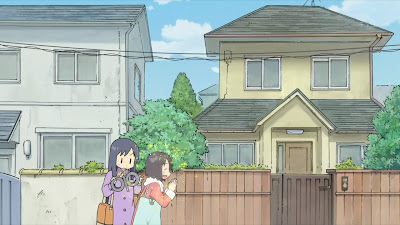 The picture-driven shiritori game between Mio and Yukko near the beginning of ep06 got this episode off to a good start for me. I found that I was extremely interested in seeing every step of the game, since the two of them would somehow confuse what syllable to use (it was mostly Yukko's fault). 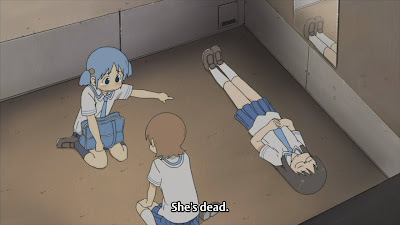 It was good to see some continuity (which, to be fair, has been there since the very beginning); now that she knows Mio can draw, Yukko shares her "awesome" pictures with her. How can you survive that?! I won't lie; the principal-deer-Yukko scene just made this episode for me. 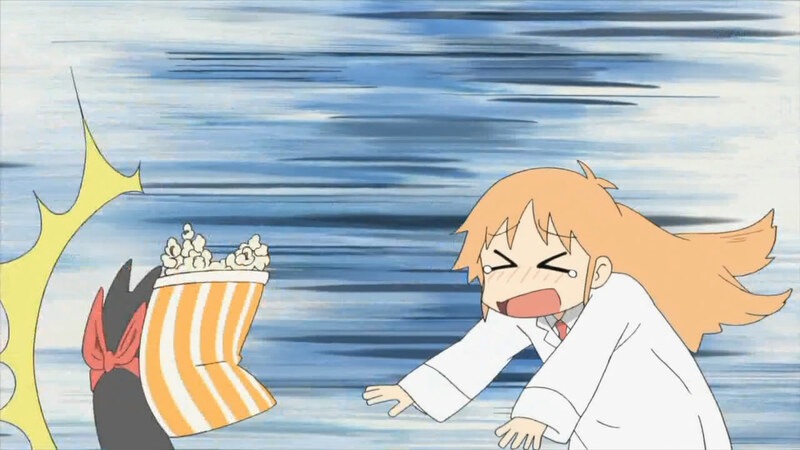 The ending was just perfect, with Yukko being unable to reveal that the principal was actually fully bald and wore a "wig" to appear semi-bald. This scene had me laughing throughout, even when I watched it a second time because Rho decided to lean over as it was finishing. The lead-in was a piece between Daiku and Sekiguchi of the Go-Soccer club (I thought it was a cheer for soccer instead of an amalgamation between go and soccer at first...) and the lead-out was a short piece about Mai abusing Yukko again (this time, with coins while playing 10-yen soccer). That's definitely a good place for priceless and irreplaceable treasures of all-importance. 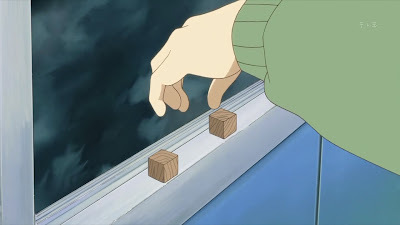 I have to admit; during the first few minutes of ep07, I sincerely wondered if I had accidentally loaded an episode from a different anime; such was the confusion caused by that random scene. However, once the wooden cube was produced, I knew that it was Nichijou (I'd also checked to see that it was the right episode, so...). 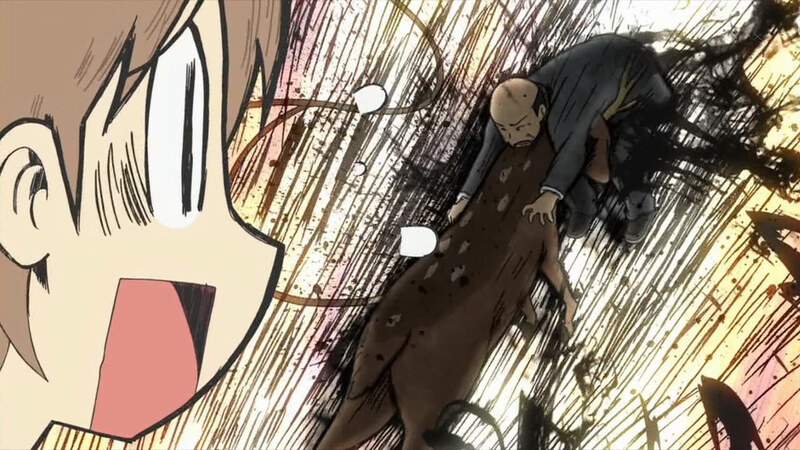 This scene, though dragging at the beginning because it was the climax of a story I neither knew nor cared about, turned incredibly funny when the guy tripped on his own feet and died. 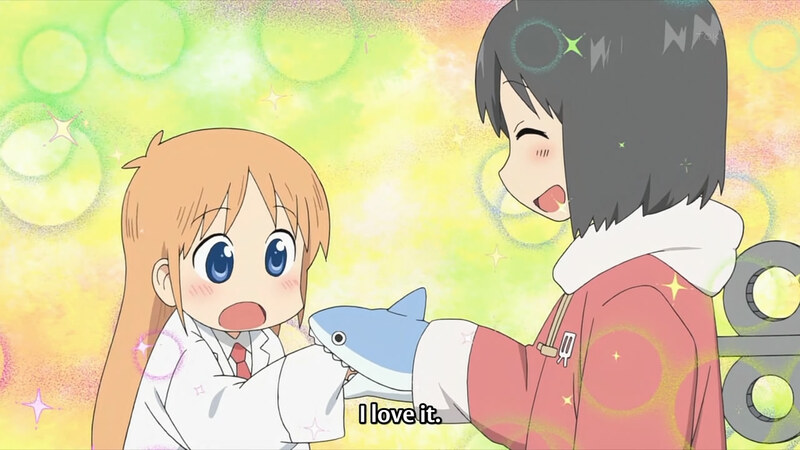 Moreover, the forced nature of placing priceless treasures on the windowsill of a blimp high in the air... Nichijou is quite enjoyable. 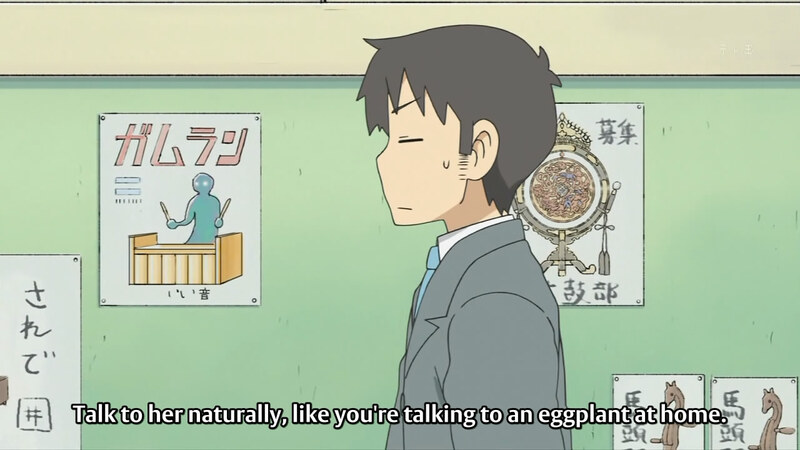 Hm, I usually talk to potatoes. Like I knew from before, it turned out that Sakurai-sensei (the nameless teacher from before) likes Sakurai-sensei. His inner thoughts and his approaching of Sakurai-sensei was pretty interesting to see; throughout this entire scene, I got flashbacks of School Rumble. If this is anything like that, I feel like I won't be disappointed. School Rumble took me a little while to get into, as well. 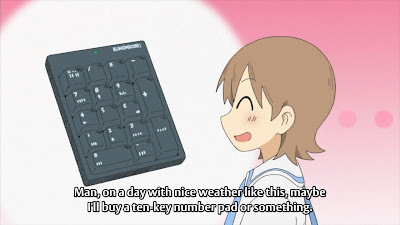 I'm happy that long scenes in this anime are punctuated by shorter, random ones (like Yukko thinking she won the lottery using last year's ticket). Some of the scenes are hit-or-miss; both Rho and I didn't particularly find the sushi scene, with the chef forgetting orders, any kind of funny. Oh well; it's hardly a deterrent when it was just 30sec. I wonder how long she took to snap out of Sparkle State. Yoshino, Mio's older sister from a prior episode, is already a hit with me, simply based on her actions with Nano. The fact that the mechanism on her back turned out to be removable is truly funny. 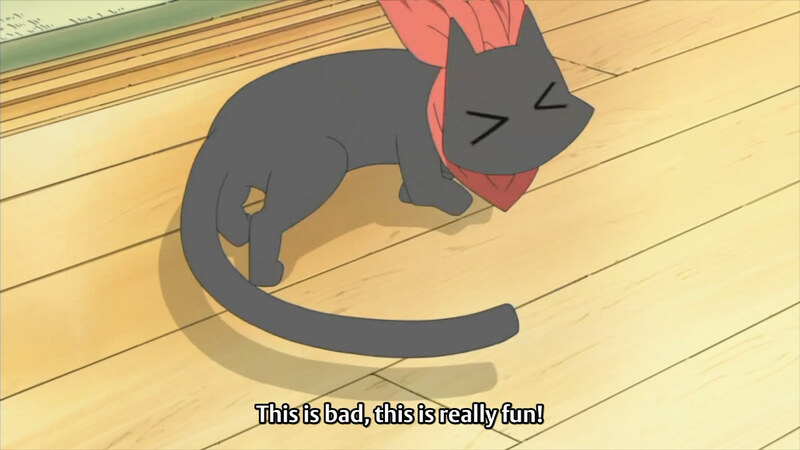 I don't particularly understand Nano's claim that she can't go out normally because, from what I see, she does. But I suppose it's one thing to go grocery shopping, where onlookers notice the mechanism and think it's an accessory, and another to go to school, where classmates eventually poke and prod. Her longing was very touching by the end of the episode, and the magician was a confusing but interesting addition. Will he turn her into a real girl? 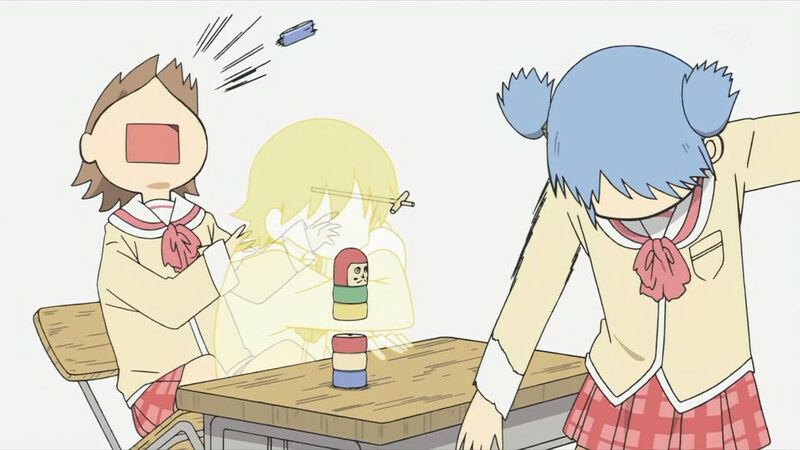 Ep08 began on a high note of Yukko completely cracking due to the lack of reaction from both Mio and Mai to her jokes. Like other characters, she freaks out when her pro-point seems to fall apart (re: Mio being unable to draw a cool guy). I realized that this scene was poorly translated only because Rho was watching with me; she didn't understand the puns due to the lack of TLs. 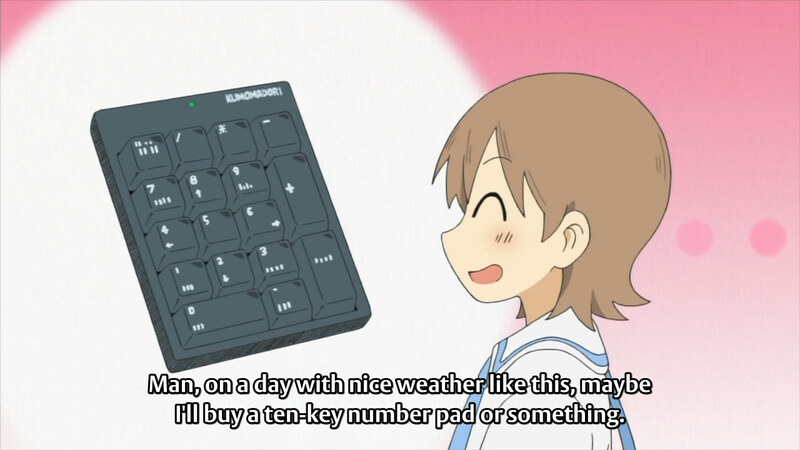 For example, "tenki" is weather and so Yukko leads from talking about the nice weather to suggesting she buy a "ten-key" number pad. That kind of pun based on language makes no sense in English without a TL. The entire scene was ripe with them so without explanation, it would be pretty confusing. Finally, a tsundere gets hit. So Mai won the challenge? 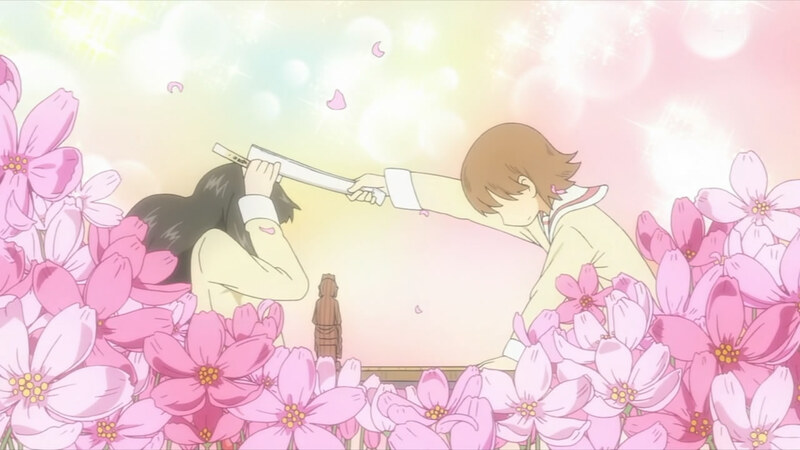 So, ep08 ended on a high note, with more interaction between Nano and the Professor. 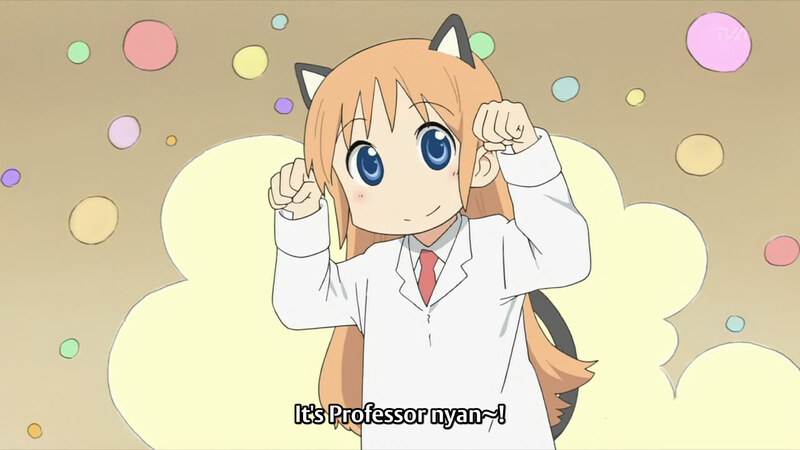 After watching four more episodes, I feel I'm really passed the ordeal with the Professor and her unethical decisions regarding Nano and playing with life. This anime is not about that; there's questionable moments everywhere if I choose to see it with that tint (such as Tachibana attacking with weapons). Ultimately, it's just funnier this way (although it's lower on my list of funny moments, since there's residual bitterness). ...especially not ones this cute. This ended up being my longest post ever, which means that Nichijou now deserves to be posted about more often than every four episodes (barring delays). It took me a few episodes to get into it, but I'm really enjoying it at this point. Even though I know better, I feel my hopes rising for this series. The indirect continuity, as if it's a background theme, is well done and most of the jokes are funny (and the ones that aren't are so only because they're not my cup of tea). Each episode builds the background story more, and I actually look forward to being in the middle of it all.